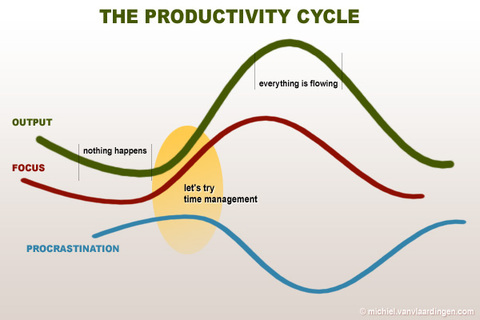 I strongly believe that energy levels, focus and productivity are related and come in closely related cycles. I’ve always had weeks I can get done great amounts of work, followed by weeks of procrastination and inactivity. Now at some point in this cycle, energy levels start to rise, but you are still in the habbit of low output. This will make you you feel guilty of not outputing, while your mind does want to. You are starting to imagine all the work you want to get done and does not seem to come along at all. This is where time management methods come in. The promise of beating procrastination and the overwhelmed feelings. So you try to follow them and it helps you get your thought in order and get more work done. Up till the point that everything is going well, you’re on a roll. If you are like me, you have already abandoned the time management method, because it feels more like a chore and everything is moving along without it. My feeling is that time management does not actually help you that much, you just try it at the time that your productivity is already bound to rise up the cycle again. The real problem comes when your energy levels are dropping again. First you overcome it by moving to simpler tasks, but slowly procrastination creeps in. The problem is, you don’t notice it, until it’s to late. At which point you don’t feel like doing much at all, most certainly not some complicated time management method. I do believe that you can influence the whole cycle, but it’s way outside the scope of time management and has everything to do with your general well-being and the habits that influence it.